Today was my birthday, or as a friend of mine calls it my "Begin Day". They seem to come and go so quickly lately. For me, my December birthday is always a nice momentary diversion from the rush, hustle, cold and snow of the holiday season. Because my wife's is on December 7th, we typically just go out to dinner at our favorite restaurant, La Merenda. We rarely exchange birthday gifts, as its such a taxing financial time of year anyway. We agreed that except on the major birthdays (the 10's) we'll just consider our night out as our gift to each other. It has become one of my favorite meals of the year. While all birthdays are good, when I think back to some of the more memorable ones there were some really good ones. 11th (Golden Birthday) I got special treatment this day and got to go across the border to a tavern with my Mom and my Stepdad (to be) in Hudson, WI to watch the Viking-Packer game. Back then, home games that weren't sold out in advance were blacked out in the Twin Cities. It was great being treated even though the game was on a fairly fuzzy screen and the Vikes got whacked 23-7. Looking back, it was as cold then as it is this year, unfortunately. Since then, I've switched allegiances, but still pull for each of them when they're not playing each other. 30th -- We went back to the Twin Cities for this birthday. Mom fronted a surprise party by saying that she wanted to take me out for my 30th birthday. While we were out for dinner, friends and relatives filled Mom's house much to my surprise. I had suspicions throughout the day that day, because the phone seemed to be ringing excessively and mom was kind of sneaking around. It was still a great surprise though. Turning 30 for me was much harder than 20 or 40. I'm not sure why, but I think it's the realization that you're not "young" anymore -even though you are. If thirty is old, I don't want to think what 50 is. Ha! 40th -- This was a much less celebrated birthday, but the cool thing about it was my wife solicited people to write me a card, or letter, or send me pictures of me. It was great fun seeing what people remembered about me, some of it good, some of it crazy. It was a great reminder that you don't have to have a big party to realize how blessed you are with so many friends and family. 50th -- Donna was given strict instructions that there was to be no surprise party. In fact, I told her I preferred to have a really small gathering, which we did. It was great being with my immediate family and a few close good friends. The gifts were funny and Donna surprised me with a fishing Kayak. Best gift ever. 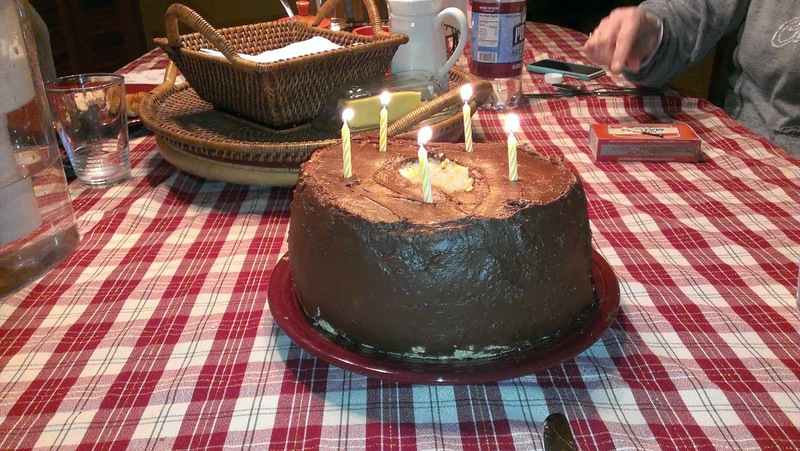 One birthday tradition that has been carried through from when I was a kid was my cake of choice is still an angel food cake with chocolate frosting. My wife delivered again this year and it was as good as ever. I think 52 is going to be a good year.